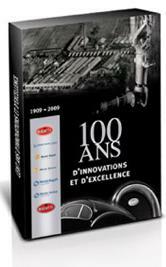 The first work on all Bugatti history, from 1909 to 2009, including the activities in "the old factory" until now, and the Artioli adventure as well as the current-day VW-Bugatti. Format: Hardcover 32 x 23 cm, in box. Price: originally 58 euro Now 45 euro only!